Owners of luxury vehicles often ship them. If the mere thought of a minor scuff mark on your expensive car feels agonizing, you should consider hiring a professional auto shipper. Your high-end car is an expensive investment. You wouldn’t want to risk having it damaged in any way. You wouldn’t trust just any logistics company to transport it. We urge you to thoroughly research companies that offer luxury car shipping services. Make sure you learn all about the process and the company before handing over the key. In our guide, you will find the information you need to successfully transport your luxury car. You will find answers to some frequently asked questions. Before we get into the details of shipping a luxury car, let’s go over the main aspects of shipping a vehicle to another state. This is what you do when you start your search and selection of transport companies. It’s important to organize your schedule and find time to research several companies. Dedicated car owners want to stay away from companies without proven safety record. When you search online, do not stop on the first page of Google. Research further and then narrow down a list. Once you’ve picked a handful of companies, the next step is to request multiple car shipping quotes. Make sure you understand all rates and familiarize yourself with the terms and conditions. Read customer reviews and check the auto transporters’ reputation and licenses. Take your time and select a trustworthy company you want to work with to ship your luxury vehicle. A logistics expert will schedule your shipment based on your desired shipping dates. Keep in mind that dates are never guaranteed. If you are looking for very specific dates, discuss this with your agent. Once you agree on the details of service, a carrier will pick up your car within the specified timeframe. It is important to remember that the carrier must inspect your vehicle and sign an inspection report. Transit time depends mainly on the distance, but pther factors also affect it. Dicsuss details with your agent. At delivery, inspect the vehicle alongside the carrier again and then sign the Bill of Lading. Now, that you’ve got an idea about how auto transport works, it is time to prepare your vehicle for shipping. Review our guide on how to prepare your car for shipping to learn all details you need to know. What are the specifics of shipping a luxury vehicle? Most luxury car owners prefer hiring an auto transporter instead of driving the car across the state or the country. The reason they do so is that they don’t expose their luxury vehicle to any possible road damages. Luxury cars are expensive, they require extra care during shipping. You need a reputable auto transporter that specializes in high-end vehicles shipping. Shipping a luxury, sports or classic automobile usually requires covered trailer. This protects the vehicle from road and weather elements such as dust and flying rock debris. This is how you will protect a high-end automobile from possible dents and scratches. However, often, not any covered trailer will work. Very often you need a covered trailer with a hydraulic lift gate that can safely load and unload any luxury or sports car. This really depends on the vehicle clearence and your personal preferences. Additionaly, some auto transporters provide white glove service and vehicle wraping. You can call our office and discuss all this with one of our logistics experts. What type of trailer is recommended to ship a luxury car? Generally, there are two types of auto transport trailers you can usually choose from – open and enclosed. Before deciding what’s best for your car, let’s delve into advantages of both options. Open auto transport is the most used auto shipping method. An open carrier is not only less expensive, but it is more efficient, and usually faster than an enclosed carrier. Depending on the type of trailer, it can fit up to ten cars at once, which makes it more efficient, less epxpensive and also less polluting. On the downside, it can expose your car to more weather and road hazards compared to enclosed auto transport. Open trailer is not recommended for high end automobiles, unless you are shipping such a car a very short distance. Enclosed auto transport is the preferred shipping method for sports, luxury, and classic vehicles. An enclosed auto carrier provides the best protection from all weather or road hazards. This, however, makes it more expensive. This option can also be a bit slower because there are less encolsed car carrier in country. An enclosed trailer is more expensive to buy and maintin. Since these carriers carry high-end cargo they need an insurance liability often up to a million dollars, and this is a hefty monthly fee. Thus, enclosed transport is certainly more expensive than open. As long as you hire a reputable auto transport company you have nothing to worry about even when you chose open carrier. But since you have to be extra protective when shiping your luxury car, you don’t want to take any chances. That is why most luxury car owners choose enclosed car transport. 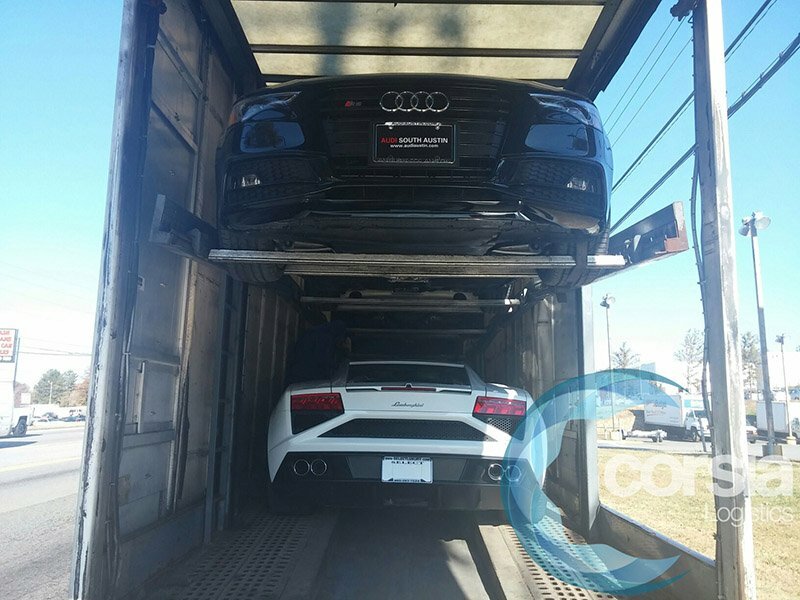 Corsia Logistics transports sports and luxury vehicles nationwide on a daily basis. If you have questions or need to speak to a logistics expert, we are here to explain the shipping process in detail and address any concerns you may have. Give us a call now. The cost of shipping a vehicle varies from $200 to as much as $2000, or more if shipping to Hawaii, Alaska or internationally. When you hire an enclosed carrier expect the rates to be $300 to $400 more expensive than open. Additionally, whentyher you choose door-to-door or terminal-to-terminal transport, this will also affect the price. To get a better idea of the economics of car shipping prices refer to our auto shipping cost guide. One thing you should always remember is to not choose an auto transport company based on car shipping price only. Research and choose based on quality of service. Low prices often mean longer time for shipping or low quality service. Should you get a car shipping insurance? Owning and taking care of a luxury car is expensive enough. But that does not mean that you should try to save money when it comes to car shipping insurance. Your luxury vehicle might be your biggest investment. We are sure you wouldn’t want to risk losing it. All because you thought getting a car shipping insurance wasn’t important enough. Every car carrier is required by law to offer insurance for its cargo. As mentioned, enclosed carriers usually provide up to a million dollar in cargo insuranse which is most than acceptable for most high-end automobiles. Yet, you need to make sure you are completely comfortable with the amount of car insurance your carrier is providing. Shipping a car may seem like a daunting task that would cost a fortune. However, choosing the right auto transporter will make the whole process a breeze. Start planning your luxury car transport early. Don’t shy away from asking questions. Relevant and timely information is the key to good decision making. When you start searching online you will find hundreds of car transport companies. Some are carriers, other brokers, and third only lead generating websites. You should not be worrier, this is the way every industry is represented today. Many companies are both carriers and brokers. Most carriers are small independent businesses that serve only one or two designated routes. Brokers are management companies, they are the connection between you (the shipper) and the carrier. In this industry, brokers, carriers, and customers depend on each other. When you arrange the vehicle hauling service the carrier becomes your primary point of contact. Any good and honest broker though will confirm that you can count on them with any question at any time. Responsible brokers make sure the customer is happy and satisfied, yet they treat their carrier fair and offer them fair market prices.Thus, an experienced broker company will explain to you how car shipping prices work and what is a fair and realistic market price of shipping a vehicle. Since this is probably one of the most imporatnt aspects when it comes to shipping a vehicle, you should discuss transport cost and analyze the answers you receive. Do you have any questions or need a good walk through the luxury vehicle shipping process? Are you ready to schedule your exotic car transport? If so, call our team at (818) 850-5258 or request a quote online. Thank you! To take car of your car from start to finish, hiring a professional is a great idea. Thanks for sharing! That’s nice way to shipping any Luxury Car. I appreciate you for this kind of stuff. Thanks for shearing it with us!